WILDSTAR DAC FMCs provides multiple channels of high speed, precision digital-to-analog converter outputs to a compatible motherboard. They provides excellent analog performance with flexible high-precision trigger options. 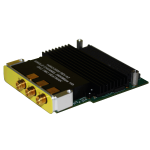 WILDSTAR DAC FMCs are shipped with a custom heatsink to ensure enables proper cooling. See all of the Annapolis Mezz Cards. The Dual 2.5 GSps 14-Bit DAC FMC allows sample rates as high as 2.5 GSps. This sample rate is dependent upon the optional internal oscillator or supplied external clock to the Digital-to-Analog Converter. This card is compatible with WILDSTAR™ 6 AMC mainboards.